A graduate of the Florissant Valley C.C. 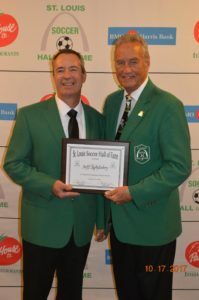 program, Jeff received NSCAA All-American honors that took him to Indiana University earning an NCAA final in 1978 for Indiana and participating in the USA World University Games. Jeff’s amateur career follows him playing for Scott Gallagher State Champions in 1977 followed by Big Four in Championship in1978, and last of the amateur teams Ruiz and Gaffney Sporting Goods after his professional playing days. While as a professional, Jeff originally signed with the Cleveland Cobras in the ASL then quickly came to St. Louis to be a member of the St. Louis Steamers in the teams’ second year of the teams existence. During his three years with the Steamers, Jeff was a finalist two years.